Singer and Brother are all you would see when exploring the sewing machines market a few years back. However, things have changed quite a bit now. Some of the newer brands have got a lot more popular than they once were, and have already started giving the otherwise dominant players of the sewing world a run for their money. The CoverPro Coverstitch Machine is pretty much everything a coverstitch machine can be, but without the steep learning curve one usually comes with. It’s versatile enough to be used for a variety of sewing projects, and you will likely be surprised at the kind of professional results it produces. Getting a bit more specific, it comes with the ability to use up to two needles at the same time. While you would need just one needle when making 2 thread chain stitches, you would be able to use 2 needles when working on projects that involve 3 thread cover stitches. Its versatility doesn’t come with a compromise on the efficiency, though, as is the case with some of the other coverstitch or chain stitch machines in this price range. It can stitch up to an impressive 1000 stitches per minute, but without many skipped stitches even when working on some of the more complex sewing projects. That’s going to mean having to spend a lot less time than you otherwise would, no matter the kind of project you’re working on. Add to that an extra large bed space and you will be looking at a superior level of sewing convenience you may have never experienced before. There’s also the Seam Tightening System (STS) that’s going to come in handy a lot more than you may think. The differential feed ratio of 0.5 to 2.25 adds to its ability to be used for industrial-level projects. Despite the CoverPro Coverstitch Machine’s ultra-rare combination of industrial-level sewing power and home-use convenience, it’s super easy to use. Just make sure you give the manual a thorough read and you will be good to go. While the CoverPro Coverstitch Machine will more than suffice for most people, what if you need something that’s more advanced? The Cover Pro 1000CPX is another coverstitch machine that’s everything the product we reviewed above is, but with many advanced features that make it the perfect choice for professional-quality coverstitching and hemming. Some of its unique features that you likely wouldn’t find in its competitors include wide trip cover hemming, arm configurations for added flexibility and more that make it the most advanced cover hem machine on the market. However, the advanced features do come with a bit of a learning curve, and you will usually need to be very careful with the settings you’re using to avoid running into issues. But if you’re willing to do that, then the Cover Pro 1000CPX will sew like a dream for you, and hem like you have never saw anything do before. Now, although the Cover Pro 1000CPX isn’t the easiest of coverstitch machines to use, but it’s surprising easy to thread and rethread it, something that can be a nightmare with advanced coverstitch machines. It’s also just as versatile as it’s advanced, and would produce just as consistent results no matter whether you’re using a thin fabric or a very thick one. 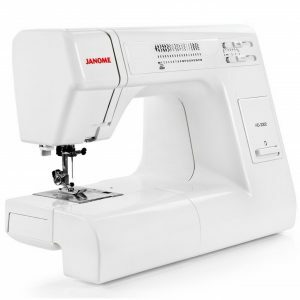 If you’re looking for something VERY efficient and versatile, but also easy to use so that you can get it sewing right out of the box, then the Janome 8077 is likely your best bet from Janome. It can sew on pretty much every type of fabric with great ease, be it thin cotton fabrics or something as thick as heavy denims. Despite its versatility and ease of use, you don’t have any issues associated as you do with some of the affordable and basic sewing machines like skipped stitches. The efficiency is certainly there with the Janome 8077, and it works very smoothly even on something that a Brother wouldn’t be able to handle easily. Now, that’s saying something, given the kind of reputation the Brother enjoys. It wouldn’t make a lot of noise at all like some of the other computerized sewing machines in this price range, while still being reliable enough to be your go-to machine for pretty much every type of sewing project. 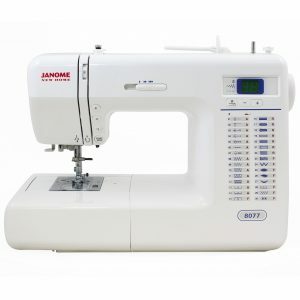 The build quality, too, is better than what you would find at this price point, which makes the Janome 8077 an all-round option for beginners and experts alike. I wouldn’t hesitate to buy it just because it’s computerized, especially given the great durability and build quality. The Janome Graceful is as close to a toy as it gets without actually being one. However, don’t let that fool you into not taking this little beauty seriously. It’s probably the most basic, portable and easy to use sewing machine on the market. It’s a great option if you want to get your kids into sewing, and they are going to absolutely love it. However, that’s not saying that it’s not something for adult sewers. There seem to be many customers who are using it as an on-the-go sewing machine and they are quite pleased with it. Similarly, it’s one of the better sewing machines for beginners who don’t want to spend a bomb on a “beginner’s” machine, neither want to deal with the steep learning curve that comes with most other sewing machines out there. The Janome Graceful has 11 built-in stitches that include most of the common types of stitches, including zigzag, straight and more. 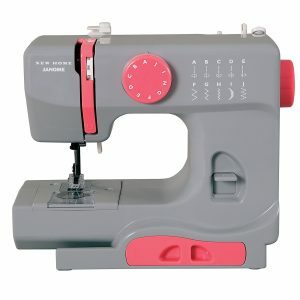 However, there are also features you certainly wouldn’t expect with this “basic” sewing wonder, especially at this price point, such as a free arm, storage for accessories (which greatly adds to its portability) and a unique easy reverse function that makes it a breeze for beginners to work on some of the more challenging sewing jobs. And guess what? It manages to offer so much while weighing JUST 5 pounds. Now, that’s quite a mix of portability and functionality for you right there. It also comes with some safety features that protect the fingers of your little one if you’re getting it for them. Finally, given its incredible price, it’s a no-brainer for all absolute sewing beginners, kids, and the traveling sewers. That said, the Janome Graceful will certainly not cut it for everyone. Even if you’re a beginner but don’t travel often, it’s very likely that you would want to go for something a bit more advanced; something that can help you quickly improve your sewing skills. Affordable. Beginner-friendly. Functional. These three things pretty much define the Janome 2212. As for the ease of use, there’s the turn dial that makes selecting your desired pattern quick and easy. It’s further enhanced by adjustable stitch width and length adjustments. The 12 built-in stitches cover most of the common stitches, and you may not need anything more than that as a beginner. They include a four-step buttonhole as well. On the functionality front, it has the drop feed feature that paves the way for highly efficient and free motion sewing as well as quilting. It’s a 110-V machine so it isn’t exactly the most powerful sewing machine, but it’s going to be just enough for most beginners. We now have enough for the beginners now. I’m sure many of you are way more experienced at sewing than the beginners and would be looking to get something well beyond a beginner machine. You decide to get a sewing machine that’s fairly expensive but comes with quite a few advanced features. It also has a pretty cool look and feel to it. You excitedly get sewing on it as soon as you unpack it. You’re working on your usual sewing projects with it, and it seems great at that. However, after a few days, you decide to work on something that involves a specialty fabric. And expecting the same kind of great results, you fire up your new, expensive and advanced sewing machine. But to your surprise, the quality of sewing it delivers is nowhere near to what it did on the other fabrics, And then it hits you. This machine, although boasting some advanced features, isn’t made to deliver the same quality of work on all fabrics, especially specialty fabric. To help you avoid ending up in such a regretful situation with your purchase, I’ve gone the extra mile and found something that’s just as great at sewing on specialty fabrics as it’s on the other general fabrics. Yes, the Janome Magnolia 7318’s 4-step buttonhole is nothing like anything. It’s unique designed to have a “balance” adjuster, which is what is going to help get amazingly precise results when sewing on specialty fabrics. But that doesn’t mean it’s only made for sewing on specialty fabrics. It comes with 18 stitches that offer a fair bit of variety with respect to the kind of projects you can use it on. However, something that wouldn’t fail to impress you is its unique and creative features. 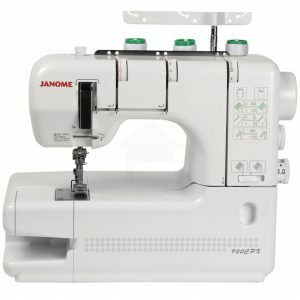 While being one of the few machines that can handle specialty fabrics so well, the Janome Magnolia 7318 also has a unique top-loading bobbin system that’s jam-proof and would help avoid so much hassle related to using the bobbin. Its 7-piece feed dog is just as unique, and is one of the best feeding systems you will find with any machine in this price range. It would make the fabric control a LOT more precise and accurate. 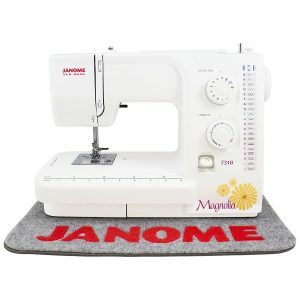 Despite the versatility and so many different, unique features, the Janome Magnolia 7318 is surprisingly easy to get familiar with; and also comes with many accessories that would otherwise cost you quite a coin. But Janome somehow didn’t let all these things translate to a very expensive price tag for the Magnolia 7318; it’s surprisingly affordable when compared to many of the high-end machines that offer a similar range of features. The Janome HD3000 is not only a truly heavy-duty machine that can handle more than what you may be able to throw at it, but also comes with loads of features that make a sewer’s life much easier. 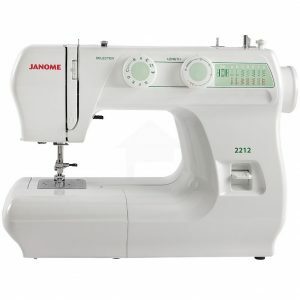 Just like the product we reviewed above, the Janome HD3000 too features a jam-proof bobbin system. 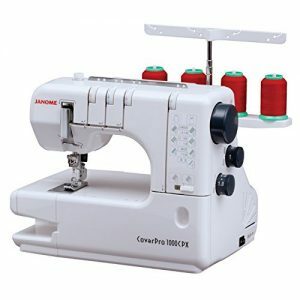 It also has an automatic needle threader that will help you get around all those eye-straining sewing tasks. It allows you to choose from a list of 18 stitches, and selecting one when sewing is incredibly easy. Similarly, the pressure foot is not only adjustable, but just requires turning the dial to adjust it to whatever you want. You would also be able to work on a wide variety of fabrics, including the heavier ones. The free arm capability gives it the flexibility that’s hard to come by in sewing machines made for heavy-duty use. Again, just to give you an idea of the kind of power it brings to the table, it will be able to sew through MULTIPLE layers of thick fabric in a way as if they were thin pieces of paper. It’s also compatible with a lot of items that you see on the market, while most other machines are very limited on this front. The versatility is just amazing; you will be able to use it on anything from silky fabrics to batting combos with just the same level of ease. Furthermore, the HD3000 also includes a plethora of useful accessories, while still being priced well under $500. 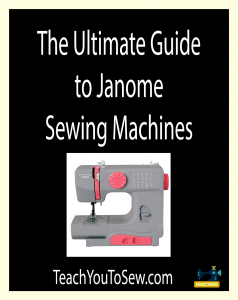 Needless to say, the Janome HD3000 is hands-down the best heavy-duty sewing machine on the market that’s available for well under $500.